Guided by a literal reading of the prophetic sections of the Bible, Christian Zionists are convinced that the world is hurtling toward a final Battle of Armageddon. They believe that war in the Middle East is God's will for the region. 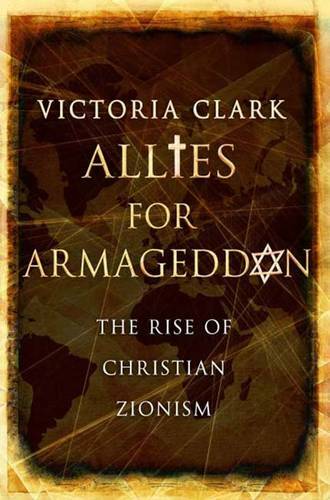 In this timely book, Victoria Clark first explores the 400-year history of this powerful political ideology, laying to rest the idea that Christian Zionism is a passing craze or the province of a lunatic fringe. Then Clark surveys the contemporary Christian Zionist scene in Israel and in the United States, where the influence of the religious fundamentalists has never been greater. Clark engages with Christian Zionism directly, interviewing leaders, attending events, and traveling with Christian Zionists in the Holy Land. She also investigates the Christian Zionist presence in Israel. She finds that the view through the Christian Zionist lens is dangerously simple: President Bush's War on Terror is a mythic battle between good and evil, and Syria and Iran represent the powers of darkness. Such views are far from rare-an estimated fifteen to twenty million Americans share them. Almost one in three Americans believes Israel was given to the Jews by God as a prelude to the Battle of Armageddon and Jesus' Second Coming. Clark concludes with an assessment of Christian Zionists' impact on American foreign policy in the Middle East and on America's relationships with European allies since the attacks of 9/11.